Are you looking for a superior pickup truck with a sporty exterior? There are few trucks more sporty than the latest F-150 Raptor. In 2019, Ford came out with its latest version of the high-powered Raptor with its spacious cab, wide cargo bed, and sport engine. You can get up to 450 horsepower with the latest Raptor and its twin turbo V6 engine. 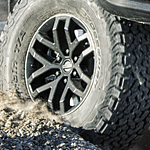 The Raptor is capable of almost anything on the road, but it’s designed to go on off-road adventures. With high towing and hauling capacity, the Raptor is a fun truck to drive. It feels like you’re in the cockpit of a Transformer. With the amount of power and acceleration in this design, you’re able to swiftly navigate traffic, and you’ll feel safer than ever with the cameras and sensors available with the Raptor. This includes the 360-degree camera that helps with blind spot monitoring and lane departure problems. Want to check out the latest Raptor in person? You can test drive at Macdonald Motors today.